April Fool’s Day is always a big day for the more mischievous of the lot, but the rest of us enjoy it just as much, as long as our role is that of spectators. But it wasn’t just a day full of pranks. Here’s our round-up of the most arresting technology and design news from yesterday. April Fool’s obviously initiated a flurry of prank videos on YouTube, but the YouTube took the time to sift and curate the best of the lot. To see the full list of videos, click here. HBO’s super-popular series Game of Thrones returned for a 3rd season this past Sunday night, sending the internet fandom into a tizzy. As a result, an auto tune remix of Arya’s list of enemies with the house motto ‘A Lannister always pays his debts’, is now a thing. Don’t believe us? See for yourself. Giving Dropbox and Google Drive some stiff competition in the area of cloud storage, Amazon has updated its Cloud Drive service with desktop file-syncing feature, which was lacking since its May 2012 launch. “The updated app makes it simple for users to put files in Cloud Drive and to access them from any of their computers, ensuring that they always have access to the latest version of their files from home and on the road,” the company states. We have always been fans of great graphic design work combined with astounding photography to make a statement, and Thierry Cohen’s ‘Major Cities Without Light Pollution falls right under that bracket. 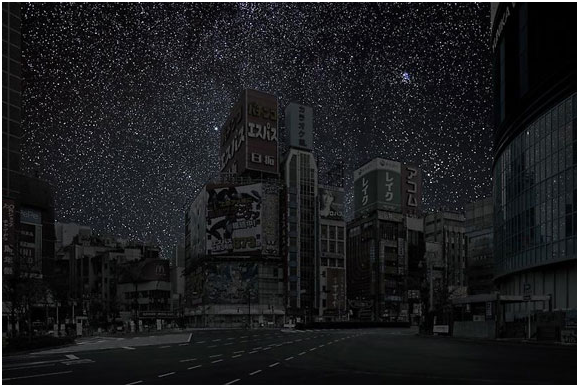 The French photographer took nighttime pictures of major cityscapes and combined them with pictures of deserted places with corresponding angles and latitudes and the results are breathtaking. Kinda goes to show what we’re all missing. See the full story and images here.